1916, 3¢ violet, o.g., never hinged, strong bright color, perfectly centered amid large evenly balanced margins, Superb, a marvelous gem; with 1991 P.F. certificate. 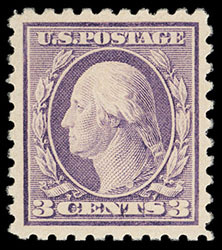 1916, 3¢ violet, o.g., never hinged, strong color on bright paper, large well balanced margins and exceptional centering, Extremely Fine and choice. 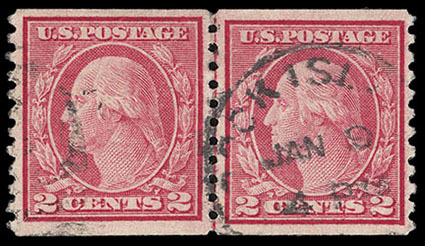 1916, 5¢ carmine error, the single error in a strip of 3, o.g., never hinged, strong bright color, fresh and F.-V.F. Scott No. 467 $800 for single. 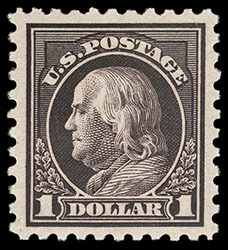 1916, 7¢ black, o.g., neatly hinged twice, perfect centering amid large evenly balanced margins all around, bold color and very fresh, a Superb gem, this being the only example to receive this grade with no others higher in any condition; with 1992 P.F. and 2009 P.S.E. certificates, the latter Graded (Gem 100, SMQ $1,100). 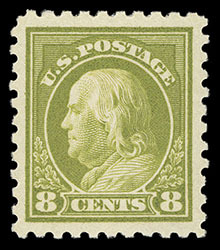 1916, 8¢ olive green, original gum, never hinged, flawlessly centered in large balanced margins, brilliant color, a Superb jumbo; with 1995 P.F. certificate and 2008 P.S.E. certificate, the latter (Graded SUP 98J, SMQ $3,300). A GEM 8¢ 1916 WITH GREAT EYE APPEAL. THE HIGHEST GRADED AND THAT DISTINCTION IS SHARED WITH ONLY ONE OTHER. 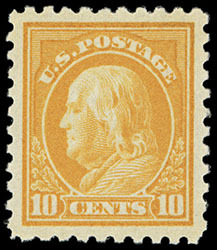 1916, 10¢ orange yellow, o.g., lightly hinged twice, brilliant color, large evenly balanced margins and precise centering, a Superb gem, this being the only example to receive this grade with no others higher; with 1992 P.F. and 2009 P.S.E. certificates, the latter Graded (Gem 100, SMQ $1,000). 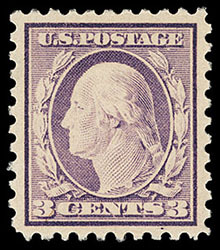 1916, $1 violet black, o.g., never hinged (light pencil on gum), choice centering amid wide margins, deep bold color, Extremely Fine; with 2006 P.S.E. certificate Graded (XF 90, SMQ $2,350). 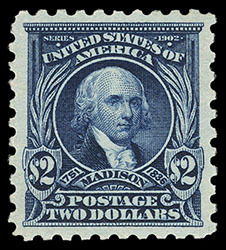 1917, $2 dark blue, o.g., never hinged, precise centering amid large beautifully balanced margins, intensely rich color, an Extremely Fine gem, a wonderful mint gem; with 1998 P.F. certificate. 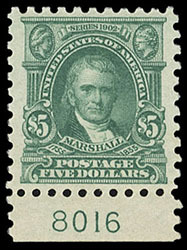 1917, $5 light green, bottom margin plate number "8016" single, o.g., never hinged, exceptional centering amid wide margins, rich vibrant color, Extremely Fine and choice, a gem plate single; with 2015 P.F. certificate Graded (XF 90, SMQ $650). 1916, 2¢ carmine, type II, horizontal coil, line pair, Rock Island duplex cancel, brilliant color, well centered, faint diagonal crease barely visible from reverse only, Very Fine appearance; with 2018 P.F. certificate. 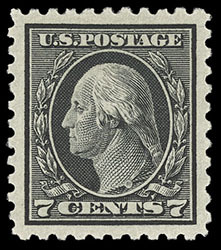 AN ATTRACTIVE USED EXAMPLE OF THE 1916 2¢ TYPE II HORIZONTAL LINE PAIR COIL - A GREAT RARITY WITH TEN EXAMPLES RECORDED. Of the ten certified examples, three are known in multiples larger than pairs. Out of these seven pairs, two are faulty and one has a machine cancel which has been called into question. 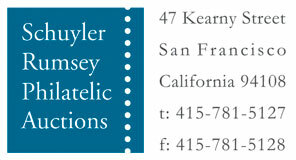 This leaves four sound line pairs which most of these have heavy or detracting cancellations. This example, although bearing a hidden fault, certainly is one of the most attractive that one can obtain.